The chances of another government shutdown shot up over the weekend after talks between Republicans and Democrats on border security broke down. The sticking points in the talks are the level of funding for barriers on the border and how much money to spend on ICE detention facilities. Another partial government shutdown could start at the end of the week if the two sides can't work out a deal. Meanwhile, there will be dueling rallies tonight in the border city of El Paso, Texas. As President Trump holds a rally to drum up support for a wall on the US-Mexico border, ex-congressman and possible 2020 presidential candidate Beto O'Rourke will give a speech across the street at about the same time denouncing that idea. The final battle is on to kick ISIS out of Syria. The US-backed Syrian Democratic Forces launched an assault to remove ISIS from its last enclave in the country. ISIS -- which once held an area of land in Syria and Iraq about the size of Portugal -- is hanging on to a tiny sliver of territory in a village in the eastern part of the country. US-led coalition airstrikes are pummeling the village, believed to be filled with at least 500 of ISIS' most experienced and battle-hardened fighters. Teachers in Denver are set to go on strike today, after talks between the teachers union and the Denver school district fell apart over the weekend. Schools won't be closed though, so some 92,000 kids will be taught for now by about 300 substitutes and about 1,400 central office staffers reassigned to classrooms. The teachers, struggling to make ends meet as the cost of living rises in the Mile High City, are demanding bigger base salaries. It's the latest in a long line of teacher strikes and protests that spread across the country last year and gained momentum this year. Travel will be almost impossible in parts of western Washington today as a wicked winter storm continues to wallop the state. Parts of Seattle were hit with more than 10 inches of snow on Saturday. That's more snow in one day than the city usually gets in a single year. As many as 300 cars were stranded on a highway in blizzard conditions after several wrecks, including a semitruck that jackknifed. More snow will fall today, including up to 36 inches in the South Washington Cascades, but things will get better by midweek, when temperatures start to warm up. Can Alicia Keys host, well, everything? Keys, the first female host for the Grammys in 14 years, won high praise for bringing coolness and class to music's biggest night, which saw big wins for women and rap. Childish Gambino's "This Is America" made history, winning Grammys for song and record of the year. That's the first time a rap song has ever won those two coveted awards. 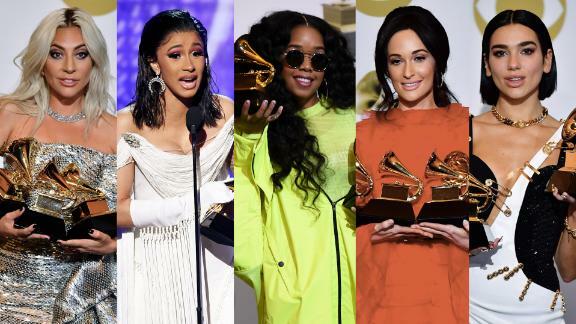 The "girl power" vibes started out with a surprise appearance by Michelle Obama during the show's opening, and they continued with country singer Kacey Musgraves nabbing four Grammys, including album of the year for "Golden Hour," and rapper Cardi B becoming the first woman to win best rap album. Soaring tributes to Dolly Parton and the late Aretha Franklin were highlights of the night, as well as Diana Ross' 75th birthday performance. Here's the full list of the winners, the night in photos and all the red carpet looks. "So my boy's name stands for something good and his little soul can find ... peace." Abdullah Kurdi, the father of Alan Kurdi, the 3-year-old Syrian refugee whose lifeless body washed up on a Turkish shore more than three years ago. A migrant rescue ship has been renamed in Alan's honor. If the UK's biggest film awards are an Oscar predictor, then "Roma" should be in pretty good shape. The Netflix flick won best film at the BAFTAs. Lindsey Vonn went out a winner in Sweden in the last race of her career. But hey, she's not the greatest female Alpine skier in history for nothing. The number of children who have died from Ebola in the Democratic Republic of Congo in an outbreak that started last year. Most of the victims were younger than 5 years old.